HomeMystery Monday – Who Is Edna? Mystery Monday – Who Is Edna? While searching Ancestry.com, I discovered a picture of Edna Reiber on her wedding day. The picture is of a low quality and from a bit of a distance, but the similarities are enough that I believe it to be her. Edna Reiber is the sister-in-law of my 2nd great grand aunt Philamena Pepperney Reiber. This photo is from a collection of Lowry and Pepperney photos dating between 1915 and 1930. While the name ‘Edna’ is written across the top and bottom (more faintly), it’s not clear who Edna is. I have three Edna’s documented in my family tree and they are all on my maternal side, while the photo collection is on my paternal side. Perhaps over time I will find another Edna tucked in a branch somewhere. 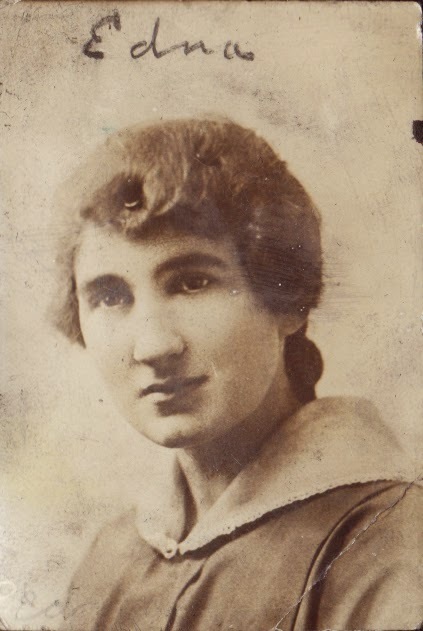 Possibly Edna Reiber Ferry (1905-1986), photograph, taken unknown location probably in the mid/late 1920s; digital image, photocopy of original, scanned in 2013 by Joseph Lowry; privately held by Mary McCaffrey, [address for private use], Canton, Ohio. Portrait of woman with hair pulled back, white collar on blouse. Provenance is Mary Pepperney Lowry to Charles Lowry to Mary McCaffrey.